The development of new asymmetric catalytic methods is of fundamental importance to industrial synthetic chemistry. The demand for optically pure synthetic intermediates and the drive to adopt greener methods of synthesis have stimulated a growing interest in biocatalysis as a selective and environmentally benign synthetic technique. Practical Biotransformations: A Beginner's Guide provides an introduction to microbes and enzymes and demonstrates their practical applications in synthetic organic chemistry. Designed as a laboratory manual, this user-friendly guide discusses standard laboratory techniques, with appropriate advice on aspects of microbial practice and associated safety. This book will be a valuable resource for synthetic organic chemists with little or no experience of biochemistry or microbiology. It is the author’s hope that this text will inspire readers to consider biocatalytic methods as real alternatives to traditional synthetic solutions. 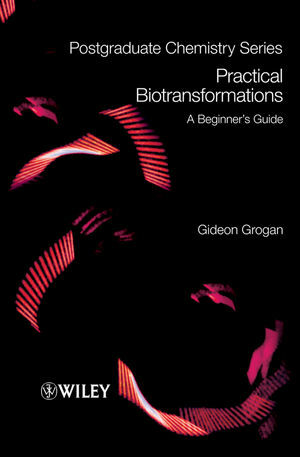 Gideon Grogan is a lecturer at the University of York, Department of Chemistry. He is also Science Manager of the Bioscience for Business Knowledge Transfer Network (a UK DTI-funded organisation for biocatalysis collaborations between academe and industry) and Deputy Director of the Centre of Excellence for Biocatalysis, Biotransformation and Biomanufacture (at York). Chapter 1: Biotransformations, Microbes and Enzymes. 1.6 Types of Enzymatic reactions. 1.8 Some Basic Characteristics of Enzyme Catalysis. 1.9 Types of Biocatalyst - Biotransformations by ‘whole cells’ or isolated enzymes. Chapter 2: An overview of biocatalyst sources and web-based information. 2.3 Obtaining organisms from other research groups. 2.6 Enzyme Suppliers and Biocatalyst Development Companies. 2.7 Genome mining for biocatalysts. 2.8 Obtaining amino acid and gene sequence information on biocatalysts. 2.9 Obtaining DNA templates for cloning. 2.11 Other interesting web resources for biocatalysis. Chapter 3: Setting up a laboratory for biotransformations. 3.3 On containment issues and genetically-modified organisms. 3.4 Equipment for handling microorganisms. 3.5 Techniques and terms in microbiology - Sterility, Asepsis and Aseptic Technique. 3.6 Disposal of viable microbial waste and disinfection of reusable equipment. 3.7 Equipment for enzymology and molecular biology. 3.8 General reagents and chemicals in a Biotransformations Laboratory. Chapter 4: A beginner’s guide to preparative whole-cell microbial biotransformations. 4.2 Storage, maintenance and growth of microorganisms. 4.4 Examples of Whole-cell Biotransformations using Bacteria. 4.5 Biotransformation by filamentous fungi and yeasts. 4.6 Whole-cell Biotransformations by recombinant strains of E. coli. Chapter 5: A beginner’s guide to biotransformations by commercially available isolated enzymes. 5.3 Hydrolytic Reactions using lipases. 5.4 Using lipases for acylation reactions. 5.6 Commercially available Coenzyme-dependent Enzymes. 5.7 Carbon-carbon bond forming reactions. Chapter 6: A beginner’s guide to the isolation and analysis and use of home-grown enzyme biocatalysts. 6.2 Cell growth and harvesting. 6.4 A typical procedure for making a cell extract from a recombinant strain of E. coli. 6.5 Purification of enzymes - a brief guide. 6.6 Techniques for Protein Purification. 6.7 Isolation of recombinant enzymes using histidine tags. 6.8 Estimation of protein concentration. 6.9 Concentrating protein samples by centrifugation. 6.10 Analysis of protein samples by sodium dodecylsulfate polyacrylamide gel electrophoresis (SDS-PAGE). 6.11 Examples of enzyme assays. 6.12 Using home-grown enzymes for biotransformations ? Some recent examples. Chapter 7: An introduction to basic gene cloning for the production of designer biocatalysts. 7.2 Background to gene cloning. 7.3 Gene amplification by polymerase chain reaction (PCR). 7.4 DNA fragment analysis by agarose electrophoresis. 7.6 Analysis by DNA sequencing. 7.7 Troubleshooting the gene amplification and cloning process. 7.9 Gene Expression in E. coli. 8.2 Site-directed or targted mutagenesis as a tool for investigating enzyme mechanism or altering catalytic attributes. 8.3 A site-directed mutagenesis experiment. Considerations and practise. 8.4 Engineering using random mutagenesis. Directed Evolution of Enzymes. 8.5 Combining rational and random mutagenesis for biocatalyst improvement. 8.6 Exploiting catalytic promiscuity for creating new enzyme activities. 8.7 Designing enzymes in silico. 1. Structures of the proteinogenic amino acids. 2. Structures of bases found in nucleic acids. 4. Recipes for Microbiological Growth Media. 6. Ammonium sulphate fractionation table. 7. Restriction enzymes and restriction sites.